The new species were discovered in the Atacama Trench and are "highly adept at living where few other organisms can." The new species have temporarily been named the pink, blue and purple Atacama snailfish. In their latest trip to the Atacama Trench, one of the deepest points in the Pacific Ocean, a team of scientists repeatedly lowered a device called a deep-sea lander overboard and watched as it sank into the cold, dark waters. The lander - essentially a high-tech trap outfitted with bait, monitors and underwater cameras - would take four hours to fall all the way to the bottom of the ocean, nearly five miles deep in some areas of the Atacama Trench, off the coast of Peru and Chile. But once there, it began recording footage of life that has rarely been documented. 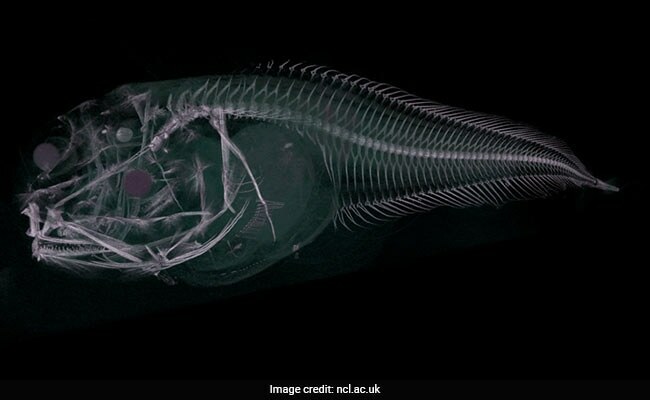 What researchers captured on camera were three new species of the "elusive" snailfish, living more than 21,000 feet beneath the surface, according to Newcastle University, which announced the findings Monday. On video, the newly discovered snailfish appeared to be long and gelatinous, with translucent skin and an ethereal movement, as they fed on bait lowered with the trap. The fish also seemed far larger than other organisms captured on camera near the bait. The new species have temporarily been named the pink, blue and purple Atacama snailfish, part of the Liparidae family, scientists said. And they're doing all right for themselves. "As the footage clearly shows, there are lots of invertebrate prey down there, and the snailfish are the top predator," said Thomas Linley, a postdoctoral research associate at Newcastle University and one of the lead researchers on the expedition. "They seem to be quite active and look very well-fed." The fish have no scales, and the hardest parts of their bodies are their teeth and the bones in their inner ear, which give them balance, he added. These features help them live in the deepest reaches of the ocean. "Their gelatinous structure means they are perfectly adapted to living at extreme pressure," Linley said. "Without the extreme pressure and cold to support their bodies, they are extremely fragile and melt rapidly when brought to the surface." However, the scientists were able to bring one of the new species of snailfish to the surface, after it swam into one of their traps. That specimen was preserved, is in "very good" condition and is being studied by a team that includes researchers from the Natural History Museum in London. Scientists acknowledged that the snailfish, with no giant teeth or "menacing frame," don't fit with "the preconceived stereotypical image of what a deep-sea fish should look like." Indeed, sea creatures discovered in the deepest reaches of the ocean typically have distinctive characteristics that come with adapting to living under extreme pressure, in freezing temperatures and out of sunlight's reach. They include deep-sea "mushrooms" that don't fit into any known category of life, a "ghostly" fish with translucent skin and a jellyfish that could have been plucked from a Pixar movie, among others recently discovered in the Mariana Trench, the deepest point in the Pacific Ocean, near the Mariana Islands. Last year, another study, led by Alan Jamieson, found that some of the organisms living in the Mariana Trench showed evidence of having ingested man-made plastics, meaning human pollution had reached even where sunlight could not. Jamieson, who is a marine ecologist at Newcastle University and was on the recent expedition to the Atacama Trench, called last year's find "very worrying." "Once these plastics reach the deep-seafloor there is simply nowhere else for them to go, therefore it is assumed they will simply accumulate in greater quantities," Jamieson said then. "Also, the number of areas we found this in, and the thousands of kilometer distances involved shows it is not just an isolated case, this is global."